The nations of the Organization for Economic Cooperation and Development (OECD) meet this month to discuss proposals to restrict OECD public ‘export credit agency’ finance for coal power plants globally. Export credit agencies are government-owned agencies or quasi-governmental institutions that provide public financing and risk guarantees for their corporations overseas. 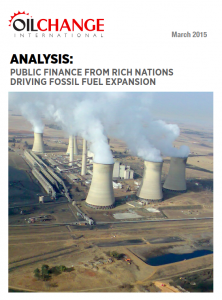 This briefing provides an analysis of a leaked OECD document on export credits for fossil fuels. We find that over the last decade, export credits have played a significant role in supporting coal power generation globally. Most alarmingly, OECD export credit financing for coal has substantially increased in recent years. Through continued public financial support to fossil fuel projects overseas, OECD nations are contributing significantly to climate change. While OECD governments are discussing limited restrictions on coal financing, they must take steps immediately to stop providing export credits and other public finance for all fossil fuels, as the climate crisis demands. OECD public financing information remains under a veil of secrecy. All governments must make strong commitments to ending international finance for coal, including coal mines, infrastructure, and power plants, immediately, along with ending public support for all fossil fuels. OECD countries should make public commitments before the United Nations climate conference in December 2015.